Vicious. V.E. Schwab. Adult/Fantasy/Science Fiction. 2013. 371 pages. 5 stars. These words people threw around—humans, monsters, heroes, villains—to Victor it was all just a matter of semantics. Someone could call themselves a hero and still walk around killing dozens. Someone else could be labeled a villain for trying to stop them. Plenty of humans were monstrous, and plenty of monsters knew how to play at being human. Victor and Eli started out as college roommates–brilliant, arrogant, lonely boys who recognized the same sharpness and ambition in each other. In their senior year, a shared research interest in adrenaline, near-death experiences, and seemingly supernatural events reveals an intriguing possibility: that under the right conditions, someone could develop extraordinary abilities. But when their thesis moves from the academic to the experimental, things go horribly wrong. Ten years later, Victor breaks out of prison, determined to catch up to his old friend (now foe), aided by a young girl whose reserved nature obscures a stunning ability. Meanwhile, Eli is on a mission to eradicate every other super-powered person that he can find–aside from his sidekick, an enigmatic woman with an unbreakable will. Armed with terrible power on both sides, driven by the memory of betrayal and loss, the archnemeses have set a course for revenge–but who will be left alive at the end? If Eli really was a hero, and Victor meant to stop him, did that make him a villain? I’m going to start this review with the characters. I love all of them. I love how I could really feel Victor’s inferiority and jealousy towards Eli through the writing. Normally I’d be annoyed at how jealous Victor is, but the writing compelled me to feel for Victor and not hate him. For the most part, I was rooting for him despite his loose moral compass. Speaking of moral compass, the book takes a complex view of heroes and villains. Each character felt like the hero in their narrative, but their twisted ways of doing things remind us that sometimes villains are born out of self-righteous “heroes.” Eli claims to be doing God’s work, and yet who is he to play God? People called him the hero, and Victor realizes that if that were the case, he is the villain. Everything about this book was great. The nonlinear timeline of the story was well-placed and made me excited because it’s nice to see context come into play at the right time. Not too early and not too late. The moment I had questions, V.E. Schwab provided answers in the following chapter through a flashback. I normally don’t like nonlinear timelines in books, but I lived for it in Vicious. Overall, I was super satisfied with the ending and I got chills with the last line. It definitely hyped me up for its second book, Vengeful, which is due to be released later this year! 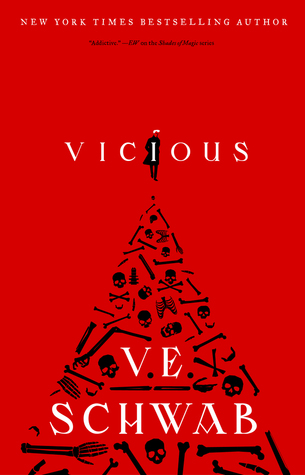 Vicious receives a well-deserved 5 stars from me. I just wrote a review about Schwab’s Shades of Magic trilogy which I absolutely lovedddd. I think I’ll give the rest of her books a shot! oooh i’m so excited you loved this one! i’ve been looking for more Schwab to try so i’m def going to prioritize this. great review! YES – this one is so good! I posted a review of it last year… Glad you enjoyed it too! This sounds so good wow!